For Howard Chiou, who will receive his PhD from Laney Graduate School, studying hospital culture through the lens of anthropology offers a way to understand and prevent medical errors. Chiou anticipates completing his MD at Emory School of Medicine next year. 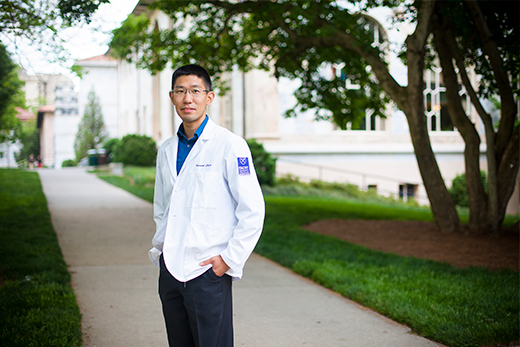 Many aspiring doctors dread the words "medical error," but for Emory graduate student Howard Chiou, they have served to fuel a greater curiosity into hospital culture. “My research topic basically developed itself after I learned about the enormity of the problem of medical error,” says Chiou, who will receive a PhD in anthropology through the Laney Graduate School on May 9. “I wondered if anthropologists might be able to help doctors and nurses, but also realized that understanding hospital cultures anthropologically might teach anthropologists about what that culture is and how it works,” he says. Interests in science and anthropology merged early for Chiou, who grew up in New York City. He was accepted to Stanford University for undergraduate studies, where he majored in human biology and also obtained a master’s degree in anthropology. After deciding to pursue both a PhD in anthropology and an MD, Chiou began researching graduate programs. He discovered that Emory’s Laney Graduate School was, at the time, one of only a few institutions in the country that offered the joint MD/PhD in anthropology. “I loved the strength and breadth of the MD/PhD Program, as well as its interdisciplinary connections with the School of Medicine and the Rollins School of Public Health,” says Chiou. Under the direction of his advisers — Emory anthropology professors Peter Brown and Carol Worthman and physicians Melvin J. Konner, who is also an anthropology professor, and Timothy G. Buchman, director of the Emory Center for Critical Care — Chiou got to work. The goal of his research has been to “to improve our understanding of hospitals as cultural and social systems undergoing dramatic change,” Chiou explains. As a medical anthropologist, Chiou was embedded in hospital units implementing a new intervention that was meant to improve patient safety through checklists and improve teamwork between doctors and nurses. “I combined tools from traditional cultural anthropology and healthcare quality improvement to study two hospital units in the U.S. and one in Australia,” he says. “I'm hoping that my work might provide those seeking to improve healthcare with new ways from which to think about creating their own changes,” he adds. After receiving his PhD, Chiou will continue his work towards earning an MD, with an anticipated graduation date of 2017. He’s now considering a career in public health and preventive medicine. Chiou’s research and ambitions embody the graduate student experience, says Laney Graduate School Dean Lisa Tedesco.